This past Saturday we enjoyed spending the day at the WNC Nature Center in Asheville, NC. Our timing ended up being great since the “A Winter’s Tail” event was also going on. During our recent visit to Asheville our family decided to stop by the WNC Nature Center. In our homeschool our boys are currently working through the Apologia Land Animals. The nature center was a great way for them to get up close and personal with all the animals we’ve been studying. To our surprise, when we arrived we discovered that their annual event “A Winter’s Tail” was going on. 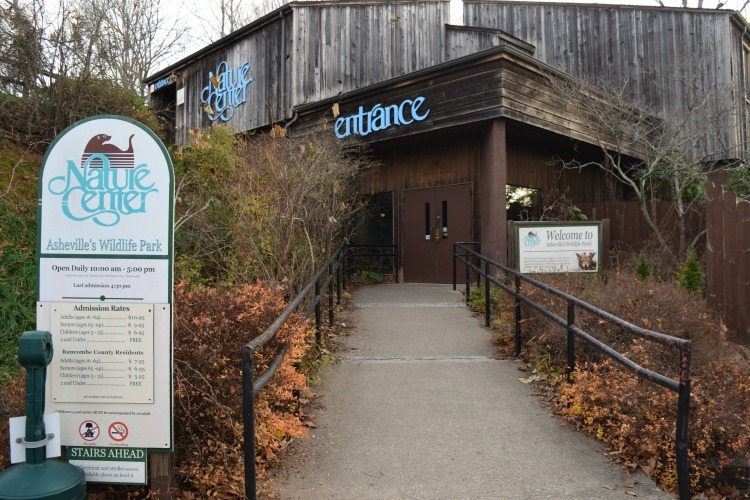 The WNC Nature Center focuses on animals and plants that are native to the southern Appalachian mountains. Throughout the 40+ acres, you’ll find over 220 animals representing more than 60 species. The first area you’ll visit is the Appalachian Station. This is where the kids can see a wide variety of reptiles and small animals. During our visit, they had a black snake out that you could pet and ask questions about. The teen volunteer (young naturalist) told us that this particular snake was around 5′ long and was 15 years old. After you finish looking at all the amazing creatures inside the Appalachian Station, it’s time to venture outside. Here you’ll follow a paved sidewalk that takes you through all the animal exhibits. The animals can be viewed very easily behind chain link fences and glass enclosure areas. I was surprised at just how large each animal’s exhibit area was, and filled with structures for the animals to play and get exercise on. You’ll see red wolves, deer, bears, birds of prey and so much more. As you follow the path, the first animal you reach is the raccoon named Sassy. We arrived just in time to enjoy Sassy’s enrichment activity. They painted a festive Christmas Tree on the glass using yogurt and placed Cheerios on the branches. She seemed to have fun eating the yogurt and Cheerios. Sassy walked away once she decided that the show was over. After enjoying Sassy for awhile, we came to the fox area. Oh goodness, these are such beautiful animals. We weren’t able to see the red fox during our visit since it was napping. The gray fox were out and such a delight to watch. The coyotes were laying out and enjoying the beautiful sunshine. Isn’t this such a beautiful creature? The gray wolves completely stole the show. My boys could have stayed at this exhibit for the rest of the day. Both the kids and wolves would run back and forth along the fence line. Almost as if playing a game. I’d say that both the wolves and the kids enjoyed this. The cougars while absolutely beautiful decided to enjoy the warm weather we’re having in December and nap in the warm sun. I was really hoping to catch them in action, but we weren’t able to during this trip. The bobcat was adorable. Guess what? It was napping too. I’m beginning to think we arrived during nap time. I honestly almost missed it. Ryan had to point it out to the kids and me. How I love watching Otters. These little guys were having way to much for me to capture on the camera, but that doesn’t mean we didn’t enjoy them. Not only can you find wild animals at the nature center, but farm animals as well. The boys enjoyed spending time at the petting zoo area after our visit with Santa. Seriously it just keeps getting better. Up close with native wild animals, a petting zoo, and now play areas! I love how they are placed through the nature center. It’s such a great way for the kids to burn off any additional energy they may have. My boys enjoyed playing on the Arachnid Adventure Playground. It’s a playground that’s a spider web theme. The nature center’s annual “A Winter’s Tail” was going on when we arrived. This event added additional fun. The kids were able to make crafts like pine cone bird feeders, garland, and more! Not only were the crafts pretty awesome, but there was also a visit from Santa. Best part from a mom’s point of view? The activities were all included with our entrance fee. How awesome is that? • The Nature Center is open 7 days a week from 10 am – 5 pm. The cost of admission is $10.95/adults, $6.96/kids (3-15), and ages 2 and younger are free. • When visiting, I would recommend about 2-3 hours to enjoy your visit. Longer if there are special events going on inside the nature center. • There are play areas that can be found throughout for the kids to enjoy. 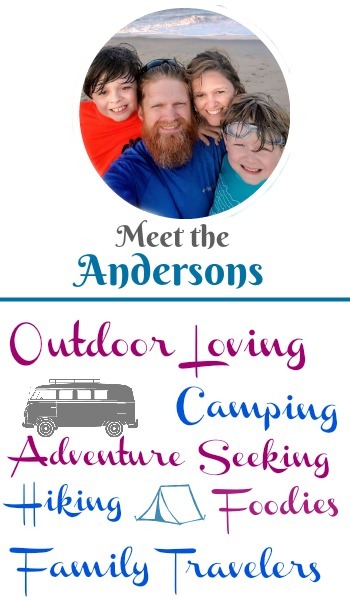 • There are picnics tables available if you brought a picnic lunch. You can also grab a quick bite at the Gift Shop.